The Texas House on Saturday voted overwhelming to place new constraints on craft breweries that grow beyond a set size or become acquired by a larger beer company. Supporters of House Bill 3287 also fought back efforts to amend the legislation to give craft brewers the right to sell some beer on site for consumers to take home – something the smaller brewers have tried to secure for years. HB 3287, blasted as anti-competitive by critics, is opposed by the Texas Craft Brewers Guild and Anheuser-Busch InBev as well as pro-business groups and a conservative Texas think tank. “Now we prepare for the Senate battle,” guild executive director Charles Vallhonrat said after the vote. A 2013 package of laws gave breweries that produce less than 225,000 barrels of beer annually to sell up to 5,000 barrels directly to customers, who must drink the beer in the taproom before they leave. As originally written, House Bill 3287 would have extended the prohibition against on-site sales to any brewery that is acquired by another company that collectively exceeds that limit. That group includes Houston’s Karbach Brewing Co., acquired last fall by A-B InBev, which makes many of millions of barrels of Budweiser and other products across the globe. A revision to the bill allows Karbach and the other larger breweries to continue to operate taprooms, but it would force them to sell their beer to a distributor and then buy it back for sale to the public. The brewers say the bill would discourage investors and will hurt their ability to grow. The only beneficiary, they say, are the distributors who already exert near-total control over how beer gets from producers to retailers. Here’s an earlier version of this story from before the House vote and here for a story from two weeks ago when this was in committee. I can only presume the distributors were behind this bill, which should tell you all you need to know. I guess this should remind us all that despite the 2013 bill that allowed on-premises beer sales at microbreweries, the big beer distributors can still throw their weight around when they want to. Same as it was last time. Now that the 85th Texas Legislature is in session, lobbyists for the Texas Craft Brewers Guild, the organization that advances the interests of the state’s craft brewers, are going to push for more. Namely, they want production breweries to be able to sell beer to-go from their taprooms. “Having off-premise sales in breweries is our No. 1 priority,” Charles Vallhonrat, the director of the guild, said. The Texas Craft Brewers Guild had hoped to make that bill law in 2015, but that didn’t happen. As a result, the Dallas-based Deep Ellum Brewing sued the state in fall 2015 — a lawsuit that has yet to be resolved. Currently, Texas law permits brewpubs, but not production breweries, to sell beer in bottles, cans and growlers to-go from their facility. Brewpubs can also offer beers from other breweries on-site, but they are limited in the amount of beer they can produce each year: no more than 10,000 barrels. Distributors, he said, are opposed to the idea because allowing consumers to buy beer to take home directly from the breweries could, theoretically, take away some of their business. That’s not how the guild sees it, however. See here for some background, and here for more on the Deep Ellum lawsuit. 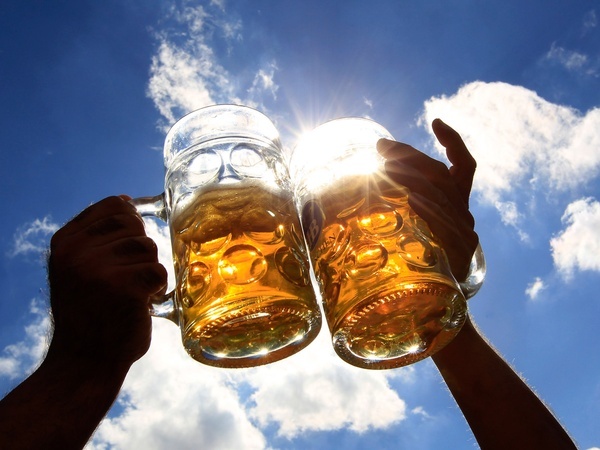 Microbreweries won the right to sell their beer to visitors in 2013, but only for on-premises consumption. It’s still not legal to pick up a six pack to go after taking a tour at whatever microbrewery you happen to be visiting. They tried again in 2015 but got nowhere, and much as it pains me to say I’d bet against them this time as well. The argument that allowing this would negatively affect the distributors in any meaningful way is ludicrous – who would ever choose to drive to a microbrewery to buy a case as opposed to picking one up at a retail location? It makes no sense, but that’s what they’re going with, and it’s always easier on issues like this to play defense, since running out the clock is all you need to do. I don’t know if any specific bills have been filed for this yet, so check with the Craft Brewers Guild for further information and any action items to take up. We return to an old favorite topic, caffeination of things that are normally not caffeinated. One of Texas’ favorite beer brands has released a new product to celebrate 108 years in business. 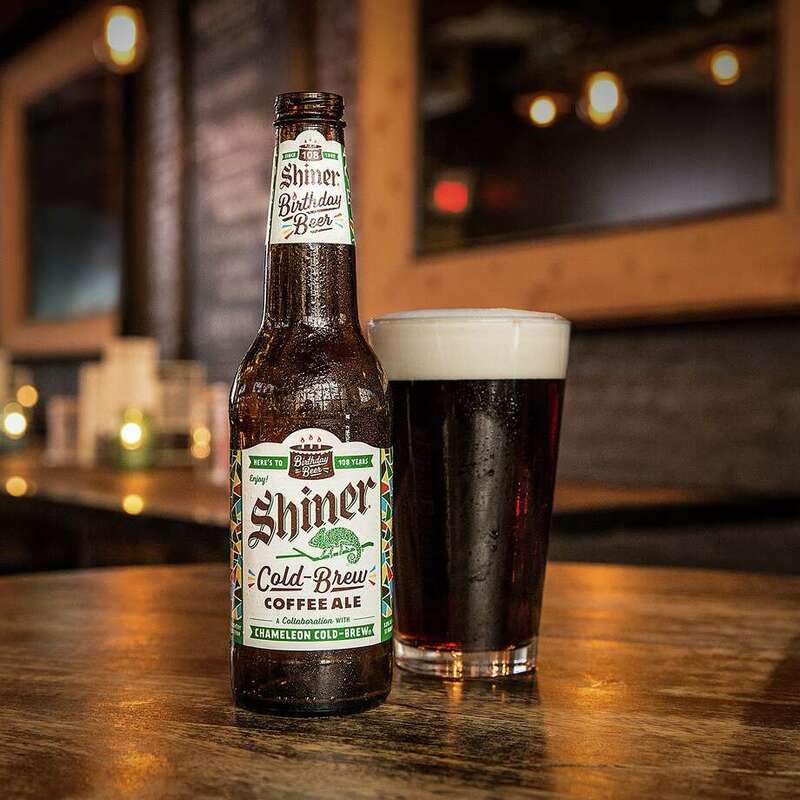 Shiner Beer’s caffeine-laden Shiner Cold Brew Coffee Ale has just hit stores. The brew is made with Chameleon Cold Brew, another Texas-based company. Chameleon has been making organic cold brew in Austin since 2010. The brand has exploded in the Lone Star State as cold brew increased in popularity. The beer will be released in cans, bottles, and on draft. It will be a limited-time offering. Shiner releases specialty limited-availability brews every year around this time. Lots of things have been caffeinated in recent years – potato chips, soap, Cracker Jack, even air. Caffeinated beer has been with us since at least 2004, though as that was a Budweiser product, I’ve no doubt that Shiner Cold Brew Coffee Ale will be superior. Alas, I myself am not a fan of coffee, so I’ll have to rely on third party reports to confirm that. Bottoms up and Happy Birthday, Shiner. The 5-year-old Karbach will be part of the company’s U.S.-specific High End business unit, joining the likes of Stella Artois and Shock Top; Goose Island, Breckenridge, Elysian and five other craft breweries; a cider company; and a hard seltzer company. High End president Felipe Szpigel cited Karbach’s Love Street Kölsch as an example of a lower-alcohol, or “session,” beer that will fill a niche in the AB-InBev portfolio. “The High End wants to see us innovate,” he said. I’m sure that quote about “resources” is a reference to the ABinBev distribution network, which is more a comment on Texas’ byzantine and archaic beer laws than anything else. I’m sure the Karbach founders (and I hope their employees) will nonetheless make a nice chunk of change off of this, and more power to them if they do, but a peek at their announcement of the deal on Facebook shows that the reaction from their customers is overwhelmingly negative. This is no surprise – ABinBev has openly mocked craft beers and the people who drink them in their advertising, and well, anyone who drinks Karbach almost certainly thinks ABinBev products are exactly what’s wrong with beer and the reason why breweries like Karbach needed to exist and have done so well. From a brand perspective, it’s at best a shotgun wedding and at worst a complete hash. I’m sure that Karbach will sell a lot more beer as a result of this deal. I just suspect that very little of that beer will be consumed by people who had ever drunk it before today. Swamplot and Houstonia have more. A Texas law that prohibits brewers from selling territorial rights to distribute their beer is unconstitutional, a judge ruled Thursday, serving up a major victory to beer companies seeking to expand their presence in stores, bars and restaurants throughout the state. The decision says the government has no compelling interest in prohibiting brewers from seeking cash compensation when negotiating a contract with distributors, who have almost exclusive authority to handle sales between producers and retailers. “This law, it was written by beer distributors to enrich big beer distributors and that is not a legitimate state interest,” said Matt Miller, senior attorney and head of the Austin office of the Institute for Justice, which litigated the case on behalf of Texas craft brewers Live Oak, Revolver and Peticolas. The law, passed three years ago, allows brewers and distributors to negotiate for things like equipment and marketing efforts, but not direct compensation. That denies brewers who have worked to build up their business the ability to “capture the value of their brand” once they are large enough to require a distributor, said Charles Vallhonrat, executive director of the Texas Craft Brewers Guild. A cash infusion from a distribution contract also would allow smaller breweries to expand operations, hire new employees and build up marketing teams to increase sales, Vallhonrat said. Thursday’s ruling by state District Judge Karin Crump in Austin came after both the brewers and the Texas Alcoholic Beverage Commission sought summary judgments in the lawsuit. After considering depositions from both sides, Crump declared the law violates state constitutional protection for economic liberty. “It took our property and gave it to them for free,” McElroy said Thursday. Arif Panju, another Institute for Justice attorney in the case, said the ruling applies to out-of-state breweries as well. Miller said it protects all entrepreneurs looking to build up their businesses. Miller said the ruling will help breweries going forward but does not address those who struck distribution deals while the 2013 law was in effect. The Texas Alcoholic Beverage Commission has 30 days to file an appeal. A spokesman said agency lawyers are in touch with the Texas Attorney General’s Office and likely will appeal. See here and here for the background, and here for a copy of the ruling. 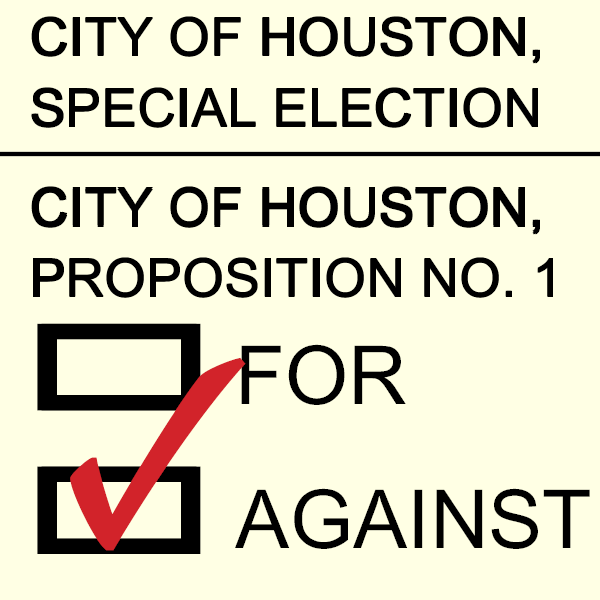 I hope the TABC will reconsider its inclination to appeal. This law serves no one’s interests except those of the Wholesale Beer Distributors of Texas. The state should not be spending its own resources pursuing a reversal of this ruling. As noted elsewhere in this story, if the original bill that forbade the microbreweries from selling their distribution rights had been about any other commodity, it would have been laughed out of the Capitol. Surely we have better things to do than this. See here for more on the Deep Ellum lawsuit, and here for more on Cuvee Coffee. Let’s hope for a clean sweep. I’ll keep my eyes open for further news. The DMN has more. Just how much is it worth for that Velvet Hammer or other local craft brew to make it to your favorite bar or convenience store? Karen Watkins, a lawyer from the office of Texas Attorney General Ken Paxton, defended the law on behalf of the Texas Alcoholic Beverage Commission and said the state must not weaken the current regulatory system. In Texas, the sales of beer and liquor are governed by post-Prohibition rules that maintain strict boundaries between manufacturers, distributors and retailers. In the three-tier system, makers of beer, wine and spirits create their products, distributors sell them, and bars and other retailers peddle the beverages to the public. “The government’s interest is in preserving the integrity to the three tier system,” Watkins said. She said the state intends to prevent any overlap between the manufacturing tier and the distributing tier. Watkins said the law helps the Texas Alcoholic Beverage Commission, for example, quickly remove tainted products from store shelves, if needed. Arguing the case for the brewers, Matt Miller, an attorney for the Arlington, Va.-based Institute for Justice, said the case isn’t about the three tier system, but about fairness. “It enriches distributors at the expense of craft brewers,” Miller said. Miller said the law prevents many brewers from selling their products in some markets, which has the effect of providing less choice to consumers and fewer opportunities to expand for craft brewers that choose not to give away distribution rights. As you know, I think the three-tier system is an archaic holdout from the Prohibition days that do nothing to enhance competition. Quite the reverse, in fact. Attorney Watkins went so far as to imply that success by the plaintiffs in this case would lead to organized crime, which thankfully the judge pushed back on. I’m rooting for the plaintiffs, as I’m sure you could guess. The judge says she expects to make a ruling in the next few weeks.